Strategic environmental assessment (SEA) is a regulatory requirement for development across Europe, North America, Australasia and elsewhere, yet understanding the legal aspects is challenging. This comprehensive guide provides that understanding in a clear and straightforward way. The introduction considers SEA and the law, explaining what SEA is, why it is needed, how it works and why it is required, as well as examining the role of the law. 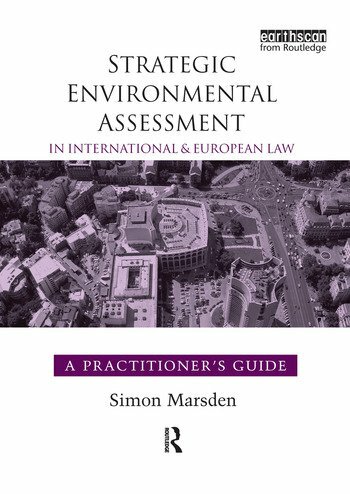 Part One provides an overview of international law, environmental impact assessment (EIA) and international law, including treaties, customary international law and 'soft law' relevant to SEA. It analyses the Kiev SEA Protocol and related UNECE conventions, the Espoo Convention on EIA in a Transboundary Context and the Aarhus Convention on Access to Information, Public Participation and Access to Justice in Environmental Matters. It also analyses the role of SEA in conservation conventions. Part Two considers how the European legal system works, including an overview of the current status of European law. It examines the EIA Directive and SEA Directive together with other relevant directives and regulations, such as the Habitats and Wild Birds Directives, the Water Framework Directive, the Public Participation for Plans and Programmes Directive, and the Structural Funds Regulations. Finally the volume draws conclusions about the relationship and comparisons between international and European law generally, and in regulating SEA. Simon Marsden is Associate Professor at the School of Law, The Chinese University of Hong Kong.